Fundraiser by Monty Ortiz : Transitional Living for Foster Youth "Aging Out"
Transitional Living for Foster Youth "Aging Out"
Did you know that in the US, more than 20,000 youth turn 18 and "Age Out" of the foster care system every year. In Texas alone, that number is over 1,200. With your help, we can provide a safe home for some of these youth. 100% of your donations go towards our campaign to purchase/build our Katy area Transitional Living Center that will be home to a number of youth as we help them transition into successful adults. 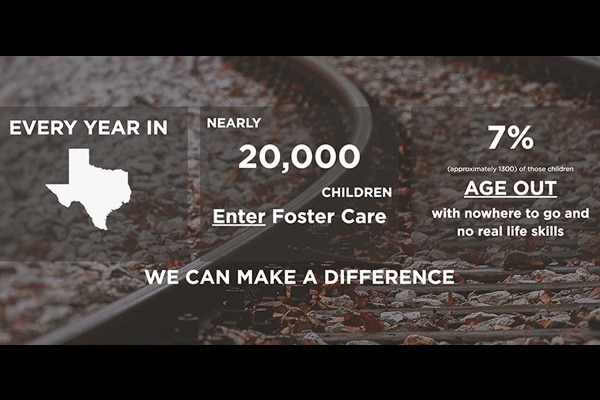 Invest in the future of the children and youth in the Texas foster care system. • After turning 18, 20% will become instantly homeless. • Only 1 out of every 2 will have some form of gainful employment by the age of 24. • Less than a 3% chance they will earn a college degree at any point in their life. • 7 out of 10 girls will become pregnant before the age of 21. • 75% of women and 33% of men receive government benefits to meet basic needs. • 1 out of every 2 will develop a substance dependence. The Transitional Living Program at Fostering Success Foundation provides a safe living environment set aside for Transitional Living and Programatic Services that are designed for older youth in foster care. A transitional living program is not an independent living program. The PAL program is designed to prepare older foster youth for independent living after they "Age Out" of foster care. The Preparation for Adult Living program strives to provide each of the more than 3,500 youth 16 years and older who are currently in foster care with the skills and resources they need to become successful, secure and productive adults members of society. The average 18 year old looks forward to the new found independence that comes with going off to college or getting their first apartment. Unfortunately, many 18 year olds aging out of foster care don’t have the same support system, resources or knowledge for a successful transition. The Fostering Success Foundation New Beginnings Box provides essential items for their new home. The holidays should be a time for celebration and family, not worry and loneliness. The Fostering Success Foundation Wish List Holiday Gift Drive focuses on giving the foster youth in group homes and Transitional Living Programs a well deserved and family oriented holiday celebration. No child should feel alone, sad or out of place during the holiday season. Going off to college can be exciting and scary for anyone and the youth in foster care who pursue higher education can be met with even more adversity during the transition. The Fostering Success Foundation College Bound School Supply Drive focuses on providing foster youth with college specific school supplies and independent living necessities.